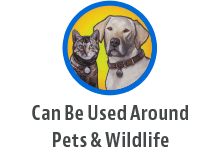 Sluggo® is an effective slug and snail killing bait that can be used around pets and wildlife. Organic gardeners use Sluggo® to control slugs and snails in their vegetable and ornamental gardens. The result is growing a slug free garden! Sluggo can be used throughout the growing season, whenever slug and snail attack threatens garden plants. Organic gardeners will be pleased to know that Sluggo is approved for use in organic vegetable gardens and where children, pets, or garden wildlife are present. When to Apply Begin using Sluggo at first sight of slug or snail damage. This can begin in early spring when perennials begin to appear. Apply the bait during the evening, as slugs and snails travel and feed mostly by night or early morning. How to Use Scatter the slug and snail bait granules on the soil around or near the plants to be protected. Apply bait evenly at the rate of 1 level teaspoon, per square yard, and reapply the bait as consumed or at least every two weeks. Do not pile. If necessary, wet ground before applying. What do they eat? Slugs and snails will eat almost anything that grows in the garden, but they prefer young, tender leaves or soft, juicy fruits and vegetables. Their rasping tongues easily shred the leaves of new seedlings, delicate flower petals, and ripening strawberries or citrus fruit. Where do they live? Slugs and snails are most active in gardens during the night and early morning. They spend their days hiding in cool, moist, dark spots – ground cover, perennial beds and rockeries or under dense shrubs and hedges. During certain weather conditions, slugs and snails may move underground. Slug Reproduction Slugs and snails look for mates mostly in the fall when temperatures are warm and the rains return. They can mate as both male and female and, after mating, both partners may lay eggs. Clumps of these 1/8-inch round eggs can be found under rocks, stepping-stones or layers of leaves.